Decades of research support the view that pricing carbon is the most economically efficient approach to reducing emissions. For this reason, economists favour the introduction of a carbon tax as a key solution to climate crisis. It was not surprising, therefore, that forty-five top economists from across the political spectrum called for the United States to put a tax on carbon on 16 January 2019, stating that it was the best solution. What was more surprising was that they recognised that political and social objections needed to be overcome. “To maximise the fairness and political viability of a rising carbon tax”, they argued, “all the revenue should be returned directly to U.S. citizens through equal lump-sum rebates”. This was an implicit recognition that their preferred solution has faced strong headwinds since the first carbon tax was introduced in Finland in 1990. After three decades, only 13 percent of global emissions are covered by a carbon price, and, in most of these cases, the price is set well below $10 per ton, adding less than $3 to a barrel of oil. In 2018 alone, there have been political setbacks for taxes in Ireland, Germany, France and Washington State. These experiences indicate that without citizen support, higher carbon prices will remain politically infeasible, high-carbon industries will be protected, and climate action will be stymied. For this reason, political-economy and behavioural economics research (from many sources, including LSE, Oxford Martin School and my own academic research summarised here) has become more concerned with how financial incentives can be designed to win greater political and social support. When it comes to carbon taxes, options can be differentiated according to how the revenue is used. go to fund green investments, normally targeting affected groups or regions. The ideal option depends on the country in question, as well as on the policy objectives being pursued. 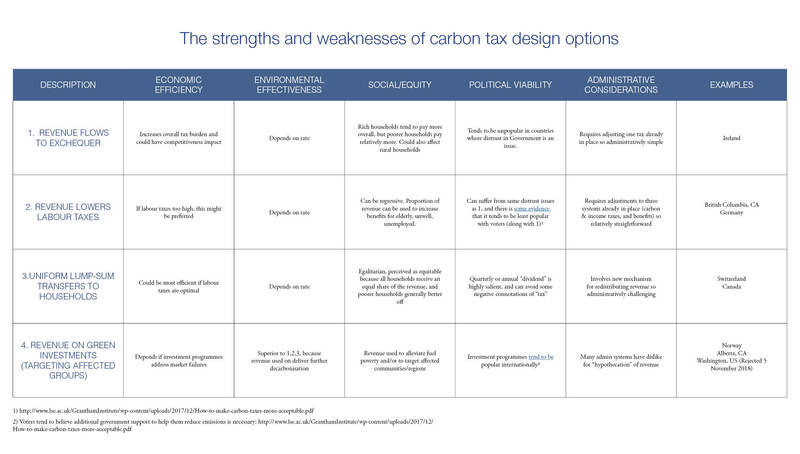 As an aid to policymaking, I set out the advantages, disadvantages and trade-offs of these designs in the table below, considering economic efficiency, environmental effectiveness, social equity, political acceptability and administrative feasibility. A higher resolution version of this diagram can be accessed here. Low annual rate increases: there is some evidence to suggest that introducing the tax initially at a low rate (€10) and increasing it incrementally could be beneficial in terms of social support. It is important (especially if the carbon tax is seen as a “silver bullet”), that tax is linked to achieving a particular target and that incremental annual increases are delivered automatically. For example, Switzerland (revised CO2 Act in 2013) and Washington State (Initiative 1631, rejected by voters on 5 November 2018) included provisions for annual automatic increases. Hybrid design: while the options in the Table above are presented as distinct, in reality most options that have been implemented around the world combine different elements of these proposals. For example, under the Swiss carbon tax, one-third of the revenues go to green spending, while much of the remaining revenues go to households as uniform lump-sum transfers. These design elements can be leveraged to win political support across the political spectrum and among interest groups. Effective political communication: this will not be an easy sell. All options require strong political leadership and skilled communications to voters. Design option which avoid the label “tax” are potentially preferable. A populist climate policy message may also connect, something along the lines of: “we are hitting polluters and passing a climate dividend on to individuals”. The key conclusion is that “strategic revenue recycling” can help build constituencies supportive of a carbon tax. There is no one correct design option, and it is important therefore that pragmatism trumps purism: the key is getting a pricing solution over the line.